Bubba Cochrane. Photo by Mark Thein of GulfWild. Bubba Cochrane always knew he wanted to be a fisherman. So, despite concerns from his family, he began his career as a deck-hand and eventually saved enough to buy a permit and boat of his own. 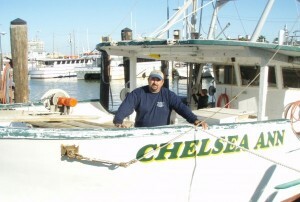 He’s 43 years old now and owns a commercial fishing business out of Galveston, Texas. Business is good – but he can easily remember what fishing used to be like. “When I got started, fishing was a race: when the season opened we fished every day until we were notified that the quota was caught. That meant lots of fishing all at once, a glut of fish in the market, and bad prices when we got back to the docks,” said Bubba, reminiscing about his early days in the fishery. Through the mid-2000s, the red snapper fishery was on the brink of collapse. Even with so few fish in the population and a short season, the fishing derbies meant that the price at the dock stayed low, hurting the profits of commercial fishermen. Fishery managers tried to address the price problem by breaking up the season into the first 15, then 10 days of each month. Fishermen would fish for 10 days, and then wait until the next month to go out again. Today in Orlando, Florida, the South Atlantic Fishery Management Council (Council) approved amendment 17A (17A) to the snapper grouper fishery management plan. Now it will go to U.S. Secretary of Commerce Gary Locke for approval. 17A closes the red snapper fishing season throughout the Southeast. It also closes a 5,000 square mile area for additional kinds of snapper and grouper fishing from Georgia to South Florida. A short-term ban was put in place in January to prevent red snapper fishing, until 17A could be finalized. Recreational fishermen – including tourists – not being able to fish as much, which hurts countless bait and tackle shops, boat dealers and mechanics, and tourist hotels and restaurants. EDF believes that catch share management is the best option for the commercial and for-hire (charter and party boats) sectors of the snapper and grouper fishery. Catch shares could potentially replace 17A’s closures with fishing seasons and reduce closed areas while fish populations rebuild. Private anglers deserve an opportunity to catch red snapper too, and fishermen and the Council have an opportunity to improve the management by exploring new tools like a tagging program. Growing numbers of Southeast fishermen agree that catch shares are the best way forward. Catch shares set a scientifically-based limit on the total amount of fish that can be caught and then divide that amount among individual fishermen or groups of fishermen. Studies have shown that catch shares bring fish populations back and benefit fishermen. With catch shares, fishermen have much more flexibility on when to fish, are held individually accountable for what they catch, are no longer forced to waste tons of fish by throwing them overboard, and fishing can be more profitable. When 17A is implemented, fishermen will focus on other kinds of fish, instead of red snapper. This can damage other fish populations or underwater habitat. Also, the uncontrolled BP Oil Disaster in the Gulf of Mexico may push Gulf fishermen into Southeast waters. Both situations will increase the amount of fishing pressure on an already distressed fishery. Catch shares reduce the need for season and area closures and the chance of damaging effort shift in fisheries. Successful catch share management is in place in the Gulf of Mexico’s red snapper, grouper and tilefish fisheries and hundreds of other fisheries worldwide. Just three years after the red snapper catch share in the Gulf of Mexico went into place, the amount of wasted fish was reduced significantly, fishermen made higher profits, and fish populations were rebounding. With the BP Oil Disaster, the flexibility of catch shares allows fishermen in areas closed to fishing to sell or lease their shares of fish to fishermen in open areas. I recently spent a few hours taking stock of how our Nation is doing, using traditional approaches to fisheries management. My conclusion: not very well. As of December 31st, sixty federally managed fish stocks and stock complexes (containing an additional twenty species or so) were either overfished, being over fished, or both. That doesn’t even count the stocks for which the scientific information is so poor that we are “flying” blind or, many important but overfished non-federal stocks. 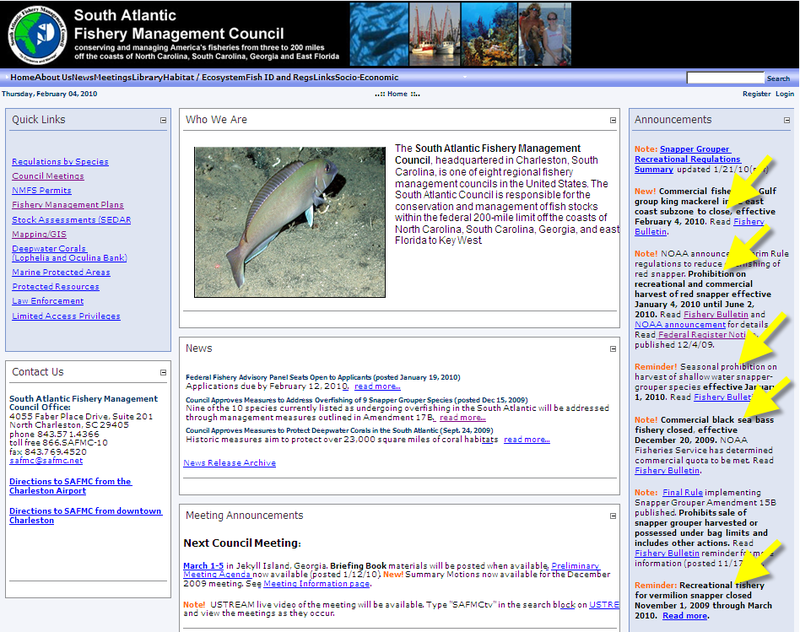 Take a look at the homepage of the South Atlantic Council‘s website (to the right). It shows closures for most of the “money fish” in the region – king mackerel, black sea bass, vermilion snapper, red snapper, groupers, and most of the other shallow-water reef fish. The costs of business-as-usual to commercial and recreational fishermen, fishing families, coastal communities, and coastal economies is staggering . . . not to mention to ocean ecosystems. Thankfully, there is a better way — catch shares. While there are no silver bullets that will fix these fishery problems overnight – the problems been decades in the making – catch shares are the clear solution. You can read more about how to design a catch share at EDF’s Catch Share Design Center. The past few weeks have been big for Southeast fisheries. Last week, the National Oceanic and Atmospheric Administration released its catch share policy, which will hopefully increase consideration of catch shares for our declining snapper-grouper fishery. With all this going on, it is no wonder that last week’s Council meeting focused on red snapper. Red snapper in the Southeast is said to have been overfished since the 1960s, but its cultural and economic value and lack of consensus on data are all reasons why the Council has yet to institute a rebuilding plan. But according to fishery laws, the Council must end overfishing of red snapper and other species. This has prompted a very close look at how to end overfishing of red snapper in a way that keeps as many fishermen on the water as possible. Currently the Council is considering large area closures to end overfishing, but is still seeking new information – like red snapper mortality rates – that might further decrease the need for large closures. The pursuit of this new information is likely to lead to delays in implementation of regulations to end red snapper overfishing, which is one reason the National Marine Fisheries Service took action to implement a red snapper interim rule. A huge amount of responsibility is put in the hands of Council members. If regulations are too stringent, more fishermen will go out of business. If regulations are too weak and do not end overfishing, the fishery will likely see future regulations that are even stricter and more devastating. Over the last year, I have heard impassioned pleas from commercial and for-hire fishermen and their families for the Council to consider how new regulations will impact their businesses and families. This is an important concern and the Council is clearly considering business impacts in its deliberations on new regulations. There is no magic answer for red snapper and other fish in trouble because all solutions will impact fishermen – commercial and recreational alike. However, a catch share for red snapper and other snapper and grouper species will help keep fishermen on the water and fishermen’s profits up. Plus, the Council can now look for technical, analytical, research and public outreach help from NOAA, via the agency’s new catch share policy, to help make this opportunity a reality. As the Council makes a decision on red snapper and starts hearing more about how the early fishing season closures on vermillion, black sea bass, and other fish are negatively effecting individual profitability and the price of fish, I encourage them to consider a catch share to address accountability, improve data, and maintain a profitable fishery.